If you want to receive a result from the activity when it finishes, call startActivityForResult(). Your activity receives the result as a separate Intent object in your activity's onActivityResult() callback. For more information, see the Activities guide. A Service is a component that performs operations in the background without a user interface. With Android 5.0 (API level 21) and later, you can start a service with JobScheduler. For more information about JobScheduler, see its API-reference documentation. For versions earlier than Android 5.0 (API level 21), you can start a service by using methods of the Service class. You can start a service to perform a one-time operation (such as downloading a file) by passing an Intent to startService(). The Intent describes the service to start and carries any necessary data. If the service is designed with a client-server interface, you can bind to the service from another component by passing an Intent to bindService(). For more information, see the Services guide. A broadcast is a message that any app can receive. The system delivers various broadcasts for system events, such as when the system boots up or the device starts charging. You can deliver a broadcast to other apps by passing an Intent to sendBroadcast() or sendOrderedBroadcast(). The rest of this page explains how intents work and how to use them. For related information, see Interacting with Other Apps and Sharing Content. Explicit intents specify which application will satisfy the intent, by supplying either the target app's package name or a fully-qualified component class name. You'll typically use an explicit intent to start a component in your own app, because you know the class name of the activity or service you want to start. For example, you might start a new activity within your app in response to a user action, or start a service to download a file in the background. Implicit intents do not name a specific component, but instead declare a general action to perform, which allows a component from another app to handle it. For example, if you want to show the user a location on a map, you can use an implicit intent to request that another capable app show a specified location on a map. Figure 1 shows how an intent is used when starting an activity. When the Intent object names a specific activity component explicitly, the system immediately starts that component. Figure 1. How an implicit intent is delivered through the system to start another activity:  Activity A creates an Intent with an action description and passes it to startActivity(). The Android System searches all apps for an intent filter that matches the intent. When a match is found,  the system starts the matching activity (Activity B) by invoking its onCreate() method and passing it the Intent. When you use an implicit intent, the Android system finds the appropriate component to start by comparing the contents of the intent to the intent filters declared in the manifest file of other apps on the device. If the intent matches an intent filter, the system starts that component and delivers it the Intent object. If multiple intent filters are compatible, the system displays a dialog so the user can pick which app to use. An intent filter is an expression in an app's manifest file that specifies the type of intents that the component would like to receive. For instance, by declaring an intent filter for an activity, you make it possible for other apps to directly start your activity with a certain kind of intent. Likewise, if you do not declare any intent filters for an activity, then it can be started only with an explicit intent. Caution: To ensure that your app is secure, always use an explicit intent when starting a Service and do not declare intent filters for your services. Using an implicit intent to start a service is a security hazard because you can't be certain what service will respond to the intent, and the user can't see which service starts. Beginning with Android 5.0 (API level 21), the system throws an exception if you call bindService() with an implicit intent. An Intent object carries information that the Android system uses to determine which component to start (such as the exact component name or component category that should receive the intent), plus information that the recipient component uses in order to properly perform the action (such as the action to take and the data to act upon). The name of the component to start. This is optional, but it's the critical piece of information that makes an intent explicit, meaning that the intent should be delivered only to the app component defined by the component name. Without a component name, the intent is implicit and the system decides which component should receive the intent based on the other intent information (such as the action, data, and category—described below). If you need to start a specific component in your app, you should specify the component name. Note: When starting a Service, always specify the component name. Otherwise, you cannot be certain what service will respond to the intent, and the user cannot see which service starts. This field of the Intent is a ComponentName object, which you can specify using a fully qualified class name of the target component, including the package name of the app, for example, com.example.ExampleActivity. You can set the component name with setComponent(), setClass(), setClassName(), or with the Intent constructor. A string that specifies the generic action to perform (such as view or pick). In the case of a broadcast intent, this is the action that took place and is being reported. The action largely determines how the rest of the intent is structured—particularly the information that is contained in the data and extras. Use this action in an intent with startActivity() when you have some information that an activity can show to the user, such as a photo to view in a gallery app, or an address to view in a map app. Also known as the share intent, you should use this in an intent with startActivity() when you have some data that the user can share through another app, such as an email app or social sharing app. See the Intent class reference for more constants that define generic actions. 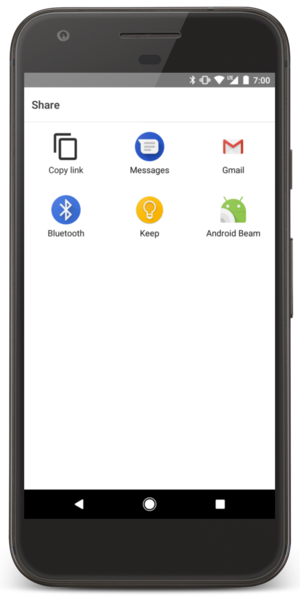 Other actions are defined elsewhere in the Android framework, such as in Settings for actions that open specific screens in the system's Settings app. You can specify the action for an intent with setAction() or with an Intent constructor. const val ACTION_TIMETRAVEL = "com.example.action.TIMETRAVEL"
The URI (a Uri object) that references the data to be acted on and/or the MIME type of that data. The type of data supplied is generally dictated by the intent's action. For example, if the action is ACTION_EDIT, the data should contain the URI of the document to edit. When creating an intent, it's often important to specify the type of data (its MIME type) in addition to its URI. For example, an activity that's able to display images probably won't be able to play an audio file, even though the URI formats could be similar. Specifying the MIME type of your data helps the Android system find the best component to receive your intent. However, the MIME type can sometimes be inferred from the URI—particularly when the data is a content: URI. A content: URI indicates the data is located on the device and controlled by a ContentProvider, which makes the data MIME type visible to the system. To set only the data URI, call setData(). To set only the MIME type, call setType(). If necessary, you can set both explicitly with setDataAndType(). Caution: If you want to set both the URI and MIME type, don't call setData() and setType() because they each nullify the value of the other. Always use setDataAndType() to set both URI and MIME type. The target activity allows itself to be started by a web browser to display data referenced by a link, such as an image or an e-mail message. The activity is the initial activity of a task and is listed in the system's application launcher. See the Intent class description for the full list of categories. You can specify a category with addCategory(). Key-value pairs that carry additional information required to accomplish the requested action. Just as some actions use particular kinds of data URIs, some actions also use particular extras. You can add extra data with various putExtra() methods, each accepting two parameters: the key name and the value. You can also create a Bundle object with all the extra data, then insert the Bundle in the Intent with putExtras(). For example, when creating an intent to send an email with ACTION_SEND, you can specify the to recipient with the EXTRA_EMAIL key, and specify the subject with the EXTRA_SUBJECT key. const val EXTRA_GIGAWATTS = "com.example.EXTRA_GIGAWATTS"
Caution: Do not use Parcelable or Serializable data when sending an intent that you expect another app to receive. If an app attempts to access data in a Bundle object but does not have access to the parceled or serialized class, the system raises a RuntimeException. Flags are defined in the Intent class that function as metadata for the intent. The flags may instruct the Android system how to launch an activity (for example, which task the activity should belong to) and how to treat it after it's launched (for example, whether it belongs in the list of recent activities). For more information, see the setFlags() method. An explicit intent is one that you use to launch a specific app component, such as a particular activity or service in your app. To create an explicit intent, define the component name for the Intent object—all other intent properties are optional. // The fileUrl is a string URL, such as "http://www.example.com/image.png"
The Intent(Context, Class) constructor supplies the app Context and the component a Class object. As such, this intent explicitly starts the DownloadService class in the app. For more information about building and starting a service, see the Services guide. An implicit intent specifies an action that can invoke any app on the device able to perform the action. Using an implicit intent is useful when your app cannot perform the action, but other apps probably can and you'd like the user to pick which app to use. For example, if you have content that you want the user to share with other people, create an intent with the ACTION_SEND action and add extras that specify the content to share. When you call startActivity() with that intent, the user can pick an app through which to share the content. Caution: It's possible that a user won't have any apps that handle the implicit intent you send to startActivity(). Or, an app may be inaccessible because of profile restrictions or settings put into place by an administrator. If that happens, the call fails and your app crashes. To verify that an activity will receive the intent, call resolveActivity() on your Intent object. If the result is non-null, there is at least one app that can handle the intent and it's safe to call startActivity(). If the result is null, do not use the intent and, if possible, you should disable the feature that issues the intent. The following example shows how to verify that the intent resolves to an activity. This example doesn't use a URI, but the intent's data type is declared to specify the content carried by the extras. When startActivity() is called, the system examines all of the installed apps to determine which ones can handle this kind of intent (an intent with the ACTION_SEND action and that carries "text/plain" data). If there's only one app that can handle it, that app opens immediately and is given the intent. If multiple activities accept the intent, the system displays a dialog such as the one shown in Figure 2, so the user can pick which app to use. More information about launching other apps is also provided in Sending the User to Another App. When there is more than one app that responds to your implicit intent, the user can select which app to use and make that app the default choice for the action. The ability to select a default is helpful when performing an action for which the user probably wants to use the same app every time, such as when opening a web page (users often prefer just one web browser). However, if multiple apps can respond to the intent and the user might want to use a different app each time, you should explicitly show a chooser dialog. The chooser dialog asks the user to select which app to use for the action (the user cannot select a default app for the action). For example, when your app performs "share" with the ACTION_SEND action, users may want to share using a different app depending on their current situation, so you should always use the chooser dialog, as shown in Figure 2. To show the chooser, create an Intent using createChooser() and pass it to startActivity(), as shown in the following example. This example displays a dialog with a list of apps that respond to the intent passed to the createChooser() method and uses the supplied text as the dialog title. To advertise which implicit intents your app can receive, declare one or more intent filters for each of your app components with an <intent-filter> element in your manifest file. Each intent filter specifies the type of intents it accepts based on the intent's action, data, and category. The system delivers an implicit intent to your app component only if the intent can pass through one of your intent filters. Note: An explicit intent is always delivered to its target, regardless of any intent filters the component declares. An app component should declare separate filters for each unique job it can do. For example, one activity in an image gallery app may have two filters: one filter to view an image, and another filter to edit an image. When the activity starts, it inspects the Intent and decides how to behave based on the information in the Intent (such as to show the editor controls or not). Declares the intent action accepted, in the name attribute. The value must be the literal string value of an action, not the class constant. Declares the type of data accepted, using one or more attributes that specify various aspects of the data URI (scheme, host, port, path) and MIME type. Declares the intent category accepted, in the name attribute. The value must be the literal string value of an action, not the class constant. Note: To receive implicit intents, you must include the CATEGORY_DEFAULT category in the intent filter. The methods startActivity() and startActivityForResult() treat all intents as if they declared the CATEGORY_DEFAULT category. If you do not declare this category in your intent filter, no implicit intents will resolve to your activity. You can create a filter that includes more than one instance of <action>, <data>, or <category>. If you do, you need to be certain that the component can handle any and all combinations of those filter elements. When you want to handle multiple kinds of intents, but only in specific combinations of action, data, and category type, then you need to create multiple intent filters. An implicit intent is tested against a filter by comparing the intent to each of the three elements. To be delivered to the component, the intent must pass all three tests. If it fails to match even one of them, the Android system won't deliver the intent to the component. However, because a component may have multiple intent filters, an intent that does not pass through one of a component's filters might make it through on another filter. More information about how the system resolves intents is provided in the section below about Intent Resolution. Caution: Using an intent filter isn't a secure way to prevent other apps from starting your components. Although intent filters restrict a component to respond to only certain kinds of implicit intents, another app can potentially start your app component by using an explicit intent if the developer determines your component names. If it's important that only your own app is able to start one of your components, do not declare intent filters in your manifest. Instead, set the exported attribute to "false" for that component. Similarly, to avoid inadvertently running a different app's Service, always use an explicit intent to start your own service. Note: For all activities, you must declare your intent filters in the manifest file. However, filters for broadcast receivers can be registered dynamically by calling registerReceiver(). You can then unregister the receiver with unregisterReceiver(). Doing so allows your app to listen for specific broadcasts during only a specified period of time while your app is running. The ACTION_MAIN action indicates this is the main entry point and does not expect any intent data. The CATEGORY_LAUNCHER category indicates that this activity's icon should be placed in the system's app launcher. If the <activity> element does not specify an icon with icon, then the system uses the icon from the <application> element. These two must be paired together in order for the activity to appear in the app launcher. The second activity, ShareActivity, is intended to facilitate sharing text and media content. Although users might enter this activity by navigating to it from MainActivity, they can also enter ShareActivity directly from another app that issues an implicit intent matching one of the two intent filters. Note: The MIME type, application/vnd.google.panorama360+jpg, is a special data type that specifies panoramic photos, which you can handle with the Google panorama APIs. A PendingIntent object is a wrapper around an Intent object. The primary purpose of a PendingIntent is to grant permission to a foreign application to use the contained Intent as if it were executed from your app's own process. Declaring an intent to be executed when the user performs an action with your Notification (the Android system's NotificationManager executes the Intent). Declaring an intent to be executed when the user performs an action with your App Widget (the Home screen app executes the Intent). Declaring an intent to be executed at a specified future time (the Android system's AlarmManager executes the Intent). PendingIntent.getActivity() for an Intent that starts an Activity. PendingIntent.getService() for an Intent that starts a Service. PendingIntent.getBroadcast() for an Intent that starts a BroadcastReceiver. Unless your app is receiving pending intents from other apps, the above methods to create a PendingIntent are probably the only PendingIntent methods you'll ever need. Each method takes the current app Context, the Intent you want to wrap, and one or more flags that specify how the intent should be used (such as whether the intent can be used more than once). For more information about using pending intents, see the documentation for each of the respective use cases, such as in the Notifications and App Widgets API guides. Data (both URI and data type). The following sections describe how intents are matched to the appropriate components according to the intent filter declaration in an app's manifest file. To pass this filter, the action specified in the Intent must match one of the actions listed in the filter. If the filter does not list any actions, there is nothing for an intent to match, so all intents fail the test. However, if an Intent does not specify an action, it passes the test as long as the filter contains at least one action. For an intent to pass the category test, every category in the Intent must match a category in the filter. The reverse is not necessary—the intent filter may declare more categories than are specified in the Intent and the Intent still passes. Therefore, an intent with no categories always passes this test, regardless of what categories are declared in the filter. Note: Android automatically applies the CATEGORY_DEFAULT category to all implicit intents passed to startActivity() and startActivityForResult(). If you want your activity to receive implicit intents, it must include a category for "android.intent.category.DEFAULT" in its intent filters, as shown in the previous <intent-filter> example. In this URI, the scheme is content, the host is com.example.project, the port is 200, and the path is folder/subfolder/etc. If a scheme is not specified, the host is ignored. If a host is not specified, the port is ignored. If both the scheme and host are not specified, the path is ignored. If a filter specifies only a scheme, all URIs with that scheme match the filter. If a filter specifies a scheme and an authority but no path, all URIs with the same scheme and authority pass the filter, regardless of their paths. If a filter specifies a scheme, an authority, and a path, only URIs with the same scheme, authority, and path pass the filter. Note: A path specification can contain a wildcard asterisk (*) to require only a partial match of the path name. An intent that contains neither a URI nor a MIME type passes the test only if the filter does not specify any URIs or MIME types. An intent that contains a URI but no MIME type (neither explicit nor inferable from the URI) passes the test only if its URI matches the filter's URI format and the filter likewise does not specify a MIME type. An intent that contains a MIME type but not a URI passes the test only if the filter lists the same MIME type and does not specify a URI format. An intent that contains both a URI and a MIME type (either explicit or inferable from the URI) passes the MIME type part of the test only if that type matches a type listed in the filter. It passes the URI part of the test either if its URI matches a URI in the filter or if it has a content: or file: URI and the filter does not specify a URI. In other words, a component is presumed to support content: and file: data if its filter lists only a MIME type. Note: If an intent specifies a URI or MIME type, the data test will fail if there are no <data> elements in the <intent-filter>. Filters that specify a data type but not a URI are perhaps the most common because most available data is dispensed by content providers. Intents are matched against intent filters not only to discover a target component to activate, but also to discover something about the set of components on the device. For example, the Home app populates the app launcher by finding all the activities with intent filters that specify the ACTION_MAIN action and CATEGORY_LAUNCHER category. A match is only successful if the actions and categories in the Intent match against the filter, as described in the documentation for the IntentFilter class. Your application can use intent matching in a manner similar to what the Home app does. The PackageManager has a set of query...() methods that return all components that can accept a particular intent and a similar series of resolve...() methods that determine the best component to respond to an intent. For example, queryIntentActivities() returns a list of all activities that can perform the intent passed as an argument, and queryIntentServices() returns a similar list of services. Neither method activates the components; they just list the ones that can respond. There's a similar method, queryBroadcastReceivers(), for broadcast receivers.